Why Don't Ice Cream Sandwiches Melt? An "ice cream" sandwich left in the sun doesn't melt. How is that even possible? 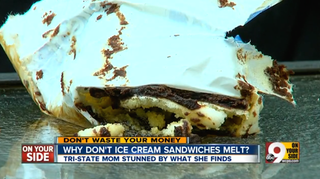 Cincinnati-area mom Christie Watson recently discovered that an ice cream sandwich, left uneaten on a sunlit patio table for 12 hours, had not completely melted. Unnerved, she took a second sandwich from her box of Walmart Great Value Sandwiches and left it out over night. Same result. Ice cream melts based on how much butterfat and cream are in it. Our sandwiches contain less, and are more affordable. But they are healthy and meet all FDA guidelines. The things you find in Walmart's sandwiches that you don't in Haagen Dazs and other premium ice creams are what food scientists call "stabilizers." According to Ice Cream Geek, stabilizers help extend ice cream's shelf life, reduces iciness, and, yes, slows the melting process. So while those fillers might not account for much of the ingredients in Walmart's snacks, they're enough to help it hold its shape in the sun. They also lower the bars' price. According to WCPO, a pint of premium ice cream can run north of 3 bucks. For the same price, you can get a dozen of Walmart's ice cream sandwiches. What a deal.